I repuploaded Wood v1.60 for R4iDS Gold, cause why not. Hello guys, Im very new to all this flash card stuff and i dont know which Wood version to load and put on my card. I have read so many things about clones and stuff. When I put Wood v1.62 on it(folder _rpg and _DS Menu.dat) on my DS Lite, I always get white screen with Menu ? error. Is that a clone card? And which Wood version should I use to fix this problem. is this firmware can be use on ds lite?.. Your cart is not supported by Wood R4. It can use YSMenu/TTMenu. Topic & download links can be found in the other topic under FLASHCART SECTION. Ok thanks. can you show me what R4 Card i should get to use the real Wood 1.62 ??? I mean I have a clone R4 and want to buy a new real R4. EDIT: Is this the real R4 that works with Wood 1.62?? IIRC the real R4 was discontinued years ago. It's unlikely to still be available. Not only that, Wood R4 has stopped updating since v.1.62. There are many games that it doesn't support. YSMenu on the other hand is up to date. Thus I don't see any benefit insisting on using that. when i use this ysmenu, can i connect my pokemon platinum with my Wii Pokemon Battle Revolution??? Neither YSMenu nor WOOD R4 would interrupt wireless connectivity, its functionality is to support the flash cart. Whether it will pair depends on your DS and Wii, as wireless connection is hardware related and setup through the respective console settings. Yes that is fine for wood are Ysmenu . I bought one long ago, and is OK, also then half oval shapes at top of R4 makes it partly original and fine to use, Although you are limited to using a 2GB micro SD card only . Hi, all. I recently bought an R4i Gold from NDS Gamer. I'm having an incredibly difficult time getting this cart to work. Absolutely nothing I've downloaded will work. I've downloaded: Wood R4 1.62, R4i_Gold_V1.69b_English, and R4i-3DS V1.81b English. None of these work across any of my systems. Any help would be greatly appreciated - I'm about ready to start tearing my hair out. If it makes any difference, I bought the cart solely to play the English translation of 7th Dragon (NDS). That's it. What's the R4i Gold's official website? No, I'm not referring to NDS Gamer's website. The flash cart's. Both your 3DS and 2DS console's firmware blocks the cart's installation. You sure the DSi is on v.1.4.1? If so, installing the kernel via it should have work. I'm suspecting it might actually be v.1.4.3 or even v.1.4.5. Which would also means the cart can't be properly setup on it either. Wood R4 is not the cart's primary kernel/firmware, and no it is also not a solution to overcome the blockage. You need to properly install the cart's firmware from the cart's official website as per mentioned in its packaging. You might need to use an NDSL. Cart's site is r4ids cn All of the firmwares listed above were taken straight from the system settings on each console. When I try to boot the cart, the screen goes white, then black. It never brings anything up. I'm not sure if it's my fault for using incorrect firmware, if my cart is DOA, or if the firmware on my console is causing the problem. I used the m3 real on my DS Lite years ago, so I'm slightly familiar with the process. Is it the same installation on these newer systems? Should I be able to download the firmware, put it on my micro SD and go from there? I appreciate the response. Just trying to get this working. Edit:spam filter got me. Fixed. Hi Guys! this new firmware is working on a 3ds? Or i need to buy another card to play my old nds games? WOOD R4 is not the deciding factor for a cartridge to work on a 3DS handheld console or not. It's a third party kernel to help run/load NDS rom that fail to load/run on the cartridge's primary firmware/kernel. It isn't the solution to resolve a cartridge that doesn't load on a 3DS handheld. Just make sure your cartridge works on your 3DS handheld, and that the cartridge brand is one that is supported/compatible with WOOD R4, only then will you be able to play NDS rom. However, since v.1.62, YWG abandoned it, so games dumped after it was last released will likely not work/load. This is funny. I think I have enough knowledge to reverse engineer this, and maybe get something out of it. Meh, what's funny is that no one's probably gonna care anymore so I won't waste my time lol. I'm surprised no one tried reverse engineering it though. 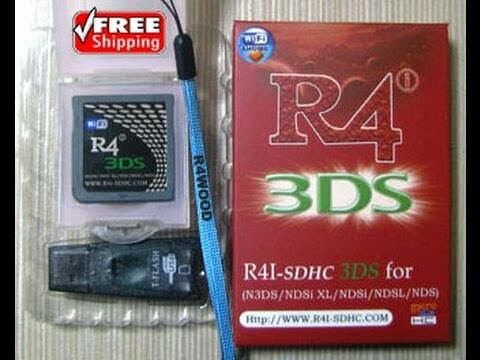 Will this work with r4i 1.4.3 card I the DSi XL on latest firmware? It should work with Wood for R4iDS Gold, and if not use Ysmenu. Hi, I'm new and didn't want to start a new topic, so please forgive my resurrection of this topic. I recently, stupidly, updated my DSi XL (not 3DS) to the latest firmware and now my r4i (V1.4.3) won't work with it. The site that I bought it from no longer offers software support for the card, what can I do? Unless your R4i is able to run DSi XL v.1.4.5 (through updating from its official webpage which no longer exist), then adding Wood R4 (whichever version) at current situation will not solve your problem. Best is you buy a cartridge whose official webpage states it is compatible/supports DSi v.1.45.